Weddings have always been a part of Historic Rosemont Manor. In fact, in 1811 the first section of the house served as a belated wedding present for the original land owners’ daughter from her new husband. Since then, the magnificent property has exchanged hands six times, most recently to the Genda family in 2009. In an effort to save the historic property from future development after the recession, the Gendas began restoration on the home. 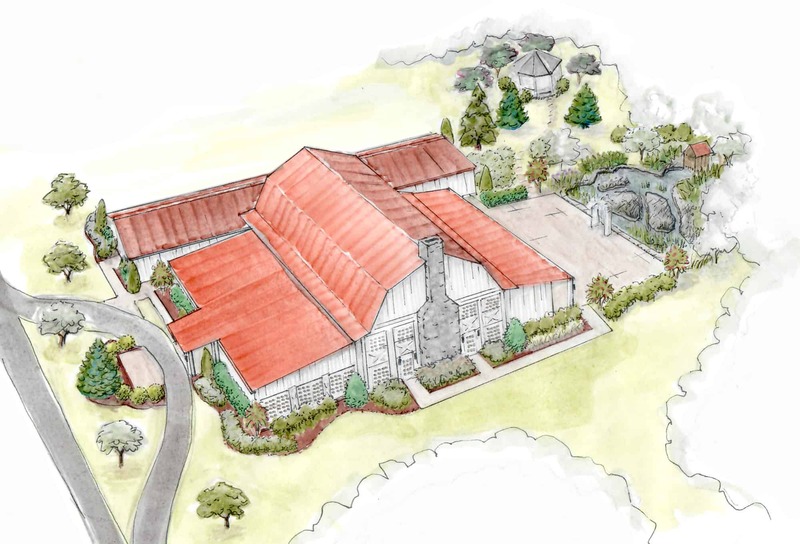 In late 2016, they came to Quarry View with a business plan to add a wedding barn venue to the Historic Rosemont Manor estate. As part of the effort to maintain the estate, Mr. Genda is very conscious of satisfying his existing customers and continuing to attract new customers. With this in mind, he developed a business plan for a brand new event venue. This venue needed to include bride and groom suites, a catering kitchen, an outdoor ceremony space, and the ability to host 400-500 guests. Overall, he wanted the venue to exude timelessness and complement the property and the existing historic structures. To achieve this he wanted a gambrel-style timber-framed barn with lean-tos on each side. Mr. Genda’s original vision was to have the entire venue in one structure. However, as we delved into the details, it became apparent that such a structure would either be overwhelmingly large or we would need to encroach on the large open cathedral ceiling in the main hall. After we determined that one structure wasn’t going to be a viable option, we added a separate building to house the storage, offices, catering kitchen, and bride and groom suites. We also installed a firewall and large overhead fire door to separate the main structure into two spaces that were less than 5,000 sq. ft. to fulfill the fire code requirements. The fire door was encased in a decorative pent roof to maintain the traditional feel of the reception space. During the design process, we decided to add a large stone fireplace to enhance the welcoming, warm atmosphere in the main hall. Massive chandeliers add the finishing touch to the main reception hall. The chandeliers can be lowered to the ground for cleaning using hoists that are concealed in the cupola. The expansive outside patio will be surrounded with new landscaping and a waterfall that will be built into the massive natural rock outcropping to the rear of the building. Mr. Genda is a fairly visual person, so we relied heavily on visual aids to communicate with him throughout the process. Using a 3D computer aided design (CAD) program we created a virtual model of the wedding barn. We conducted several webinars using a web-based meeting software that allowed us to share our screen with Mr. Genda. This allowed us to present our ideas and make changes to the model as Mr. Genda watched from the comfort of his home or office. Mr. Genda’s daughter-in-law is an architect, and she provided hand-drawn sketches of the site and interior of the building based on the computer-generated images that our designer provided. The sketches served as unique marketing materials for the facility before it was built. We enjoyed working with Mr. Genda, and we can’t wait to complete this project and see the new memories that will be created at Historic Rosemont Manor.